It’s that time of year again! The 2018 United States Sailboat Show kicks off on October 4 and runs through October 8 in our hometown of Annapolis, Maryland. Internationally recognized as the world’s “largest and most prestigious sailboat show,” the United States Sailboat Show features an extensive array of exhibitors, vendors, and educational events.¹ The Atlantic Cruising Yachts team is gearing up for the show where we will be exhibiting the North American debut of the Astréa 42 and the Annapolis debut of the Ipanema 58. The Fountaine Pajot Astréa 42 is an exceptional sailing catamaran that incorporates elegance and performance in every aspect of its dynamic design. The expansive living and lounging areas coupled with the yacht’s ease of handling makes it ideal for family cruising or for placing into charter within our exclusive Waypoints® destinations network. We are proud to bring this distinctive yacht to North America for the very first time! The Fountaine Pajot Ipanema 58 recently arrived at our docks in Annapolis after an exciting journey across the Atlantic Ocean from the factory in La Rochelle, France. We documented her progress on our Facebook and Instagram pages where you can find exclusive travel tracking imagery and first-look photos. As a Flagship yacht, the 58 does not disappoint. With a 270 square-foot cockpit, 6 cabins/heads, and more, its extensive luxuries are perfect for placing into our Crewed Yacht Charter program. Along with these magnificent sailing yachts we will be hosting live Business Yacht Ownership® seminars at Dock F1. The seminars will teach you how it’s possible to offset 80-100% of new yacht costs. An independent, certified financial planner will be on hand to explain the program and answer questions. For those who just can’t wait for the United States Sailboat Show we are hosting the Boat Show Preview Open House on Saturday, September 22 from 10 am – 4 pm. This is a remarkable opportunity to receive personal tours of the Astréa 42 and the Ipanema 58. A tour of the 58 requires sending an RSVP to kris.vereen@atlantic-cruising.com. 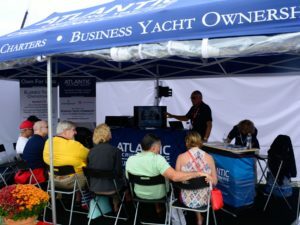 If you are interested in learning about our Business Yacht Ownership® program, watch a live webinar before attending our Boat Show Preview Open House and come to have your specific questions answered in-person without the show crowds. We have an exciting season of boat shows and industry events ahead of us! Be sure to sign up for our newsletter to stay up-to-date on the latest news. 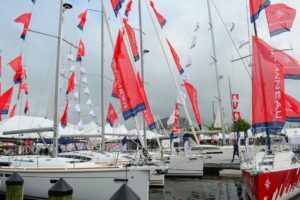 Be prepared for your visit to the United States Sailboat Show with these tips for parking, accommodations, and tickets. All the images are the property of Atlantic Cruising Yachts and/or used with permission. Atlantic Cruising Yachts, LLC ("ACY") maintains this website to provide general information about ACY and its Boat as a Business®, Business Yacht Ownership® and Waypoints® programs. The materials on this website are for informational purposes only and do not constitute accounting or tax advice. Persons receiving information through this website should not act or rely upon this information without consulting their own accountants or tax advisors. ACY neither accepts requests for accounting advice or services nor offers accounting advice or services through this website. Communication with ACY through this website, by email or otherwise, does not create an accountant-client relationship. ACY makes no representations or warranties of any kind, express or implied, as to the operation or content of this site. ACY expressly disclaims all other guarantees, warranties, conditions and representations of any kind, either express or implied, whether arising under any statute, law, commercial use or otherwise, including implied warranties of merchantability, fitness for a particular purpose, title and non-infringement. In no event shall ACY or any of its members, officers, employees or affiliates be liable, directly or indirectly, under any theory of law (contract, tort, negligence or otherwise) to you or anyone else, for any claims, losses or damages, direct, indirect, special, incidental, punitive or consequential, resulting from or occasioned by the creation, use of or reliance on this website (including information and other content) or any third-party websites or the information, resources or material accessed through any such websites. The materials on this website are provided only as general information which may or may not reflect the most current legislative or regulatory requirements or the requirements of specific industries or of states. Readers should not act upon this information without consulting their own accounting advisor.